Ukrainian levkoy is relatively young breed. The first specimens of this breed were bred in Ukraine by the felinologist Biryukova Elena Vsevolodovna. Currently, the St. Petersburg Island Of Love cattery is the leader among catteries of this breed, in which selective work on Ukrainian levkoy continues. The breed was created by crossing the Scottish Fold cats, from which the Feline gene passed, and the Don Sphynx, from which the cats received a gene responsible for the lack of hair. Characteristic features of the breed: a muscular body with a narrow oval breast, a slightly upwardly bent back line, strong and fairly long paws, the head when viewed from above forms a pentagon smoothed at the corners, and the profile has a stepped appearance with almost parallel lines of the forehead and nose. Ears as well as Scottish folds can be obtained either upright stride, or folded fold. By nature, they are friendly cats. Sociable enough, but not intrusive. They will not constantly demand from you attention and communication. But in a few minutes attention and games will reward you with a sweet rumbling and a kind of "cat's bounty." 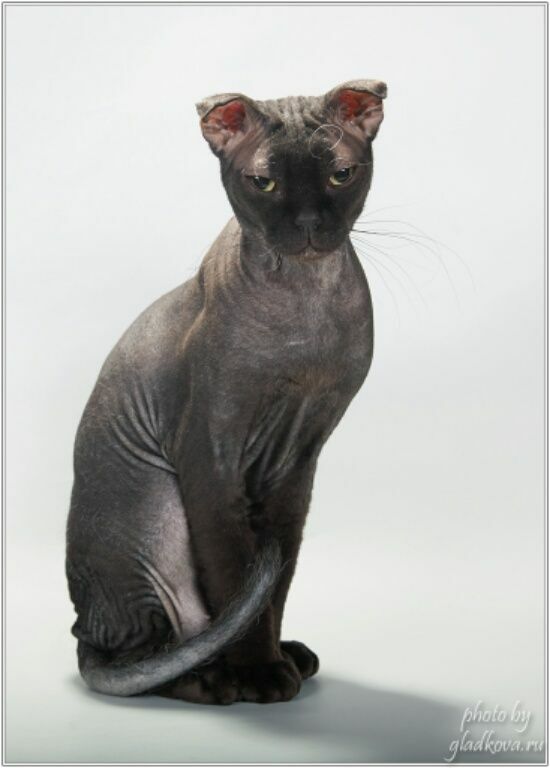 Appearance of Ukrainian gilly cat cats is very specific. To whom they may seem even frightening, or even creatures from the world of the potestry. But their appearance is very deceptive. By nature, Ukrainian levkoys are very affectionate and lovely. Since most individuals are born either naked or with a small wool cover, cats need to ensure accommodation in a fairly warm room, and try to save them from drafts. In general, cats of this breed are also rather unpretentious in their content. It is recommended to give cats a dry feed with a high energy output (for example, Royal Canin Sphynx) and once, and preferably twice a day, change the water. And of course you need to ensure the cleanliness of the tray, regularly changing the filler according to the manufacturer's recommendations. Concerning hygiene, only naked-born cats require regular washing, individuals with a wool cover, just like all cats wash themselves. Regularly it is required to check the purity of the auricle.